Like an étude for dolly track and zoom lens, the suspense flick Three finds genre-hopping director Johnnie To exercising his mastery of visual style, perspective, and buildup. The setting is a Hong Kong hospital, where a crooked cop, a criminal, and a neurosurgeon match wits and wills over six tense hours, forming a triangle of hubris and destructive obsession. As in last year’s corporate musical Office, the director embraces artificiality; the action is constrained to a handful of sets, with clothes and décor designed in a strict palette of blues and mint greens to better offset the occasional dab of blood red. To is one of the purest directors working today, and he flourishes within Three’s self-imposed limits, folding and reorienting the space of the hospital using privacy curtains, swinging doors, and a constantly moving camera—in the process producing a rollickingly entertaining movie. The script—credited to Lau Ho-leung, Mak Tin-shu, and Yau Nai-hoi—deviously sets up a ticking-clock premise. 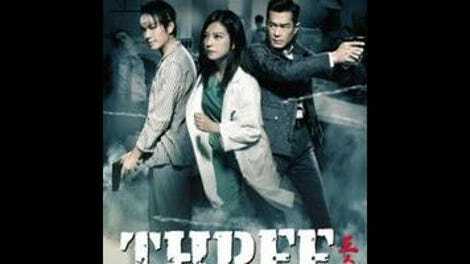 Shun (Wallace Chung), part of a gang of armed robbers, is rushed in for surgery after a shootout with police, but refuses to consent to treatment at the last possible moment, trapping cop-in-charge Ken (To favorite Louis Koo) and attending surgeon Dr. Tong (Vicki Zhao) in a series of professional and legal loopholes. As Shun stalls for time, handcuffed to a gurney with a burr in his head, his gang’s continuing crime spree plays out on the hospital’s swivel-mounted TVs. The police need to link him to a crime, while Dr. Tong needs him operated on as soon as possible, under pressure from back-to-back surgeries that ended in serious complications. In the movie’s body-horror-like moral universe, it’s all about what part of themselves characters are willing to sacrifice to save face. The wordplay of “operating theater” comes to mind, given that Three turns the doctor’s over-use of English jargon into an early running gag; surgery becomes an act of performance (in more ways than one), while the curtains of the neuro ward create proscenium arches for intrigue and misdirection. The movie is pervaded by a sense of the theatrical, from the soundstage-bound setup to the clownish bit characters weaving in and out of its three-way conflict. 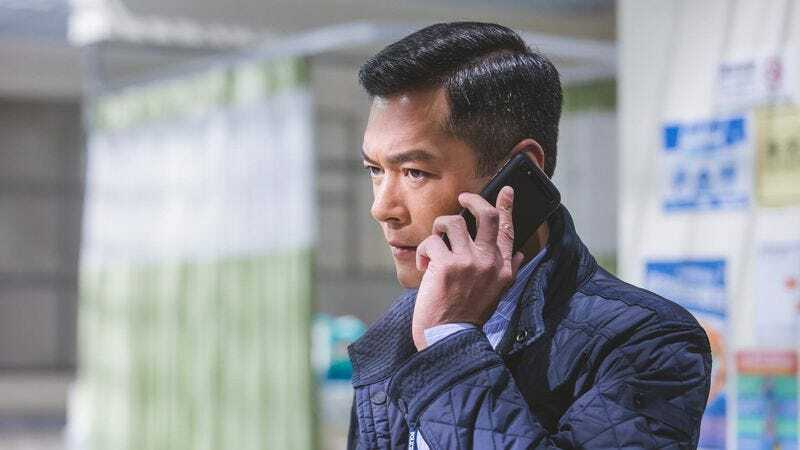 (Call it “clash of the tragic downfalls.”) The fictional Victoria Hospital—a play on both the colonial names of Hong Kong’s real-life hospitals and on Three’s theme of Pyrrhic victory—is an absurd place where the patients scheme and run loose. Shun hums Mozart and shows off his intellectual bona fides through quotations (from Bertrand Russell to the Soviet marine biologist Avenir Tomilin), all while holding off necessary surgery; he’s willing to sacrifice his brain to prove his smarts, just as Ken is willing to break the law to get a criminal. Only Dr. Tong is given any backstory; she is the more modern and sympathetic figure caught between these two classic genre types. As in To’s superb Drug War, which starred Koo as a mainland meth kingpin who turns informant to avoid the death penalty, the twists and crisscrosses build to a downer ending that seems inevitable in retrospect. Men with more pride than time have been a career go-to for To, but here, he delivers a frenzied, swinging-for-the-fences aesthetic to match; perhaps his publicly stated plan to retire in five years has something to do with it. The camera cuts in extravagant diagonals, punched up by zooms or stretched by wide-angle lenses. There are overhead shots, frames within frames (including a shot framed through a bullet hole in a cranium), frantic movements that border on slapstick, and even an esoteric reference to Luc Besson’s The Big Blue that does double duty as a visual pun on Three’s color scheme and a nod to the themes shared by both films. To’s artifice and imaginative visual compositions turn every beat of suspense or change in point of view into a bold gesture. Tension mounts between outsize egos before exploding (very literally) in the final 15 minutes. Green screens and digital tricks have never been a strong suit for this old-school, on-set craftsman, and the climax’s slapdash effects work occasionally proves distracting. Still, it gives To a chance to best his antiheroes’ hubris with a feat of true creative excess: a shootout presented as an unbroken, four-minute shot, accomplished in part by having the actors freeze in place. Sure, he could have just shot it in slow motion—but would that be as fun to make, or watch?